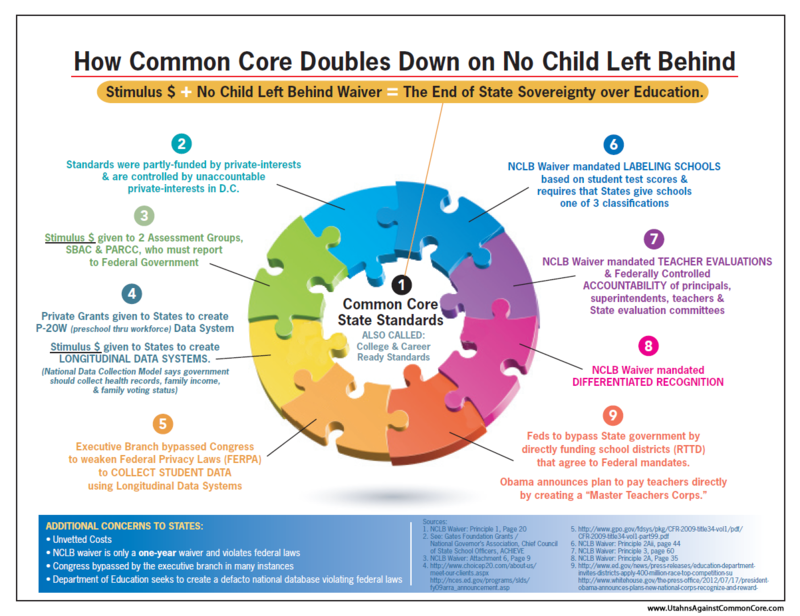 Have you had this experience while attending Common Core meetings? DESE tried the Delphi technique at the eight Common Core meetings around the state on May 2. Seven of those meetings were "delphied". Attendees stated their concerns were not addressed and questions not answered. This is an open Webinar for anyone across the country who would like to get trained on how to defeat the "Delphi Technique" that is used to achieve a false consensus in public workshops and visioning meetings. If you want to attend register below. If you can't attend the live Webinar don't worry as we will be taping it too. What exactly IS the Delphi Technique? More and more, we are seeing citizens being invited to "participate" in various forms of meetings, councils, or boards to "help determine" public policy in one field or another. They are supposedly being included to get "input" from the public to help officials make final decisions on taxes, education, community growth or whatever the particular subject matter might be. Sounds great, doesn't it? Unfortunately, surface appearances are often deceiving. Generally, you will find that there is already someone designated to lead or "facilitate" the meeting. Supposedly, the job of the facilitator is to be a neutral, non-directing helper to see that the meeting flows smoothly. 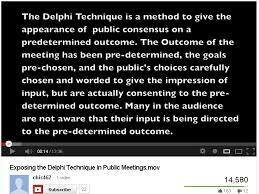 The process used to "facilitate" the meeting is called the Delphi Technique. This Delphi Technique was developed by the RAND Corporation for the U.S. Department of Defense back in the 1950s. It was originally intended for use as a psychological weapon during the cold war. Of course there is more but I think that you get the gist of what we are up against. This webinar will be done in the comfort of your home with your own computer. The real Delphi technique was designed as a structured way to help a panel of experts converge their predictions/forecasts by submitting their predictions anonymously, hearing others' predictions anonymously, and then revising their answers based on what they heard (without being swayed by whose forecast was whose). It was developed during the cold war to help defense experts converge their predictions and recommendations to the best possible forecast to allow the military to be as strategic as possible. It may be that people have tried to twist the Delphi technique to bad aims, but it wasn't originally designed that way, and it is not a way to describe any group process in which a facilitator describes small group questions to a larger group. Getting the historical facts straight will help strengthen your argument. Thank you for your remarks, Max. Then what would be your description of the type of meeting as in the video? Would you agree with the statements in this link? Perhaps this is what has happened in the Delphi Technique? I think if the participants are not treated as experts, and don't have the opportunity to revise their statements based on hearing them read back, it is not a true Delphi method. The main point of the Delphi method was for a panel of experts to converge. If the organizers said, "we're using the Delphi method to ensure a good process," then you should tell them, "no you're not, we need to be able to hear our work read back and comment on it and revise it so we know the message we intend is what you'll take away from this." Also, a true Delphi method would probably have all stakeholders in the room. However, if the organizers did not say "we are using the Delphi method" and they just said, "we're collecting your questions and will take them back for consideration," then it seems not very fair to the Delphi method to say that they were using it when in fact they were just doing a not-very-accountable job of facilitating a public meeting. Sort of like if your 3-year old handed you some mud and sticks and said, "look what I cooked" and you ate it and thought, "that must be a mud pie" and went and threw out all your recipes for Mississippi mud pie thinking, "Ew, never want to eat that again!" and didn't notice Mississippi Mud Pie is made with chocolate and not actual mud! As I see it, the Delphi Tech is used to stay on top of resistance/opposition, in order to better frame the propaganda messaging, in order to win the war of ideas, not to actually get any ideas on how to improve the program or ever ending it for any reason whatsoever. If it was ever a good technique, it has been stolen, as with so many things, and morphed into evil advantage...kind of like how Pelosi uses "spiritual" words to sway attitudes (and very badly,IMO! ).